Christophe de Courson is a serial entrepreneur in new technologies and particularly in the fast-moving mobile app sector. He created his first venture in 2005, called e-Business Applications, which provided consultancy and some digital communication strategies and web initiatives. In 2009, with the launch of the iPhone and Apple's app store, he created RDMobile in order to help companies harness the power of the mobile ecosystem. RDMobile helped develop B2B apps and games that could be used by brands to create stickiness with their users. Around the same time, Christophe also became president of RDMobile, and a shareholder in the company Manage And Com, which provides Internet access and green energy solutions to estate housing complexes. 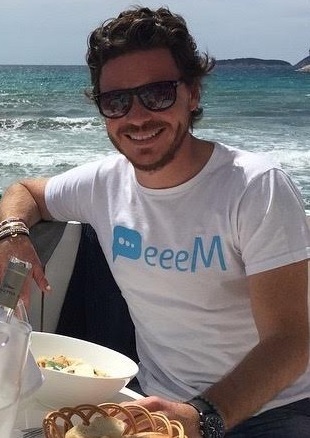 With this strong entrepreneurial experience, Christophe joined Hambel in March, 2013 as CEO to help manage the company’s strong growth and make the company’s anonymous messaging app PeeeM a success. Now, PeeeM has more than 2 million users, concentrated mainly in the Middle East , Africa and Europe with more than 1 million texts sent per day. I have a strong ability to analyze both people and situations. I love to solve problems through analysis, and by creating out-of-the-box solutions. I usually know what people want before they say it. I am confident in my ability to know what a person, or a company, is doing and, therefore, know that I will have the appropriate responses during a meeting. I don’t spend a great amount of time preparing for meetings. The challenge of the conversation, or meeting, pushes me to have the right solution or answer on the spot. My mind is always formulating solutions for some problem – whether personal or business. I need to be feeding what I call the “practice of the mind” all the time. For this reason, I don’t sleep that well, but if you don’t use your muscles every day, they become numb. I want PeeeM to become the window to freedom of speech for countries who really need it. There are some places where no freedom of speech is allowed and everything is under surveillance and scrutiny. PeeeM provides a kind of freedom for people who really need it, and will risk their lives to find it. My business aspirations are similar to my personal aspirations. What is great in our business is that you can provide something that is really going to help lives, while still remaining a business. The digital world is moving so fast; it is fascinating and at the same time it is a little scary. We need to be really sharp and be in the right time frame every time we launch something. So far, it has been a success. Create something. It is fascinating to create something that is used by millions of people around the world. The fact that your ideas / products have been validated by persons whom you don’t know, who hail from a completely different culture, make me feel that I have succeeded. It is a great and amazing experience, and this has pushed me to improve PeeeM. South of France (French Riviera). This is home. I was born there, part of my family lived there. It is the only place on earth where I feel truly rejuvenated. I don’t have a favorite product. What I like in a product is the idea behind it, or how a team has imagined such a thing. There are a lot of great products around us, and what makes them great is when they have a natural appeal. In other words, when the product comfortably fits a (seemingly) natural need. For now, my only passion is my company and more specifically the product that we have created: PeeeM. I really enjoy working with my partner and friend, Morgan Segalis, to improve our app every day, even if it’s very hard to grow a startup company.